Thanks to its innovative business ideas and superior products, Liberty has managed to rise to the very top of the United States safe manufacturing industry. Today it’s the #1 seller of residential safes in the country. The company offers three different lines of safes: Liberty, National Security and Centurion. Though the company markets to many different demographics, all of Liberty’s safes feature advanced fire protection technologies, elegant designs and of course uncrackable security. Unlike most safe manufacturers, Liberty always offers a free lifetime replacement warranty on all of its products. If your Liberty safe ever gets damaged because of fire, flooding or theft the manufacturer will send you a new one free of charge. 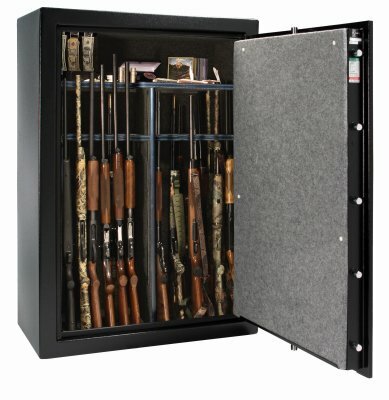 This entry level safe from Liberty can hold 18 guns– which is more than enough room to meet the gun storage needs of most families. Measuring in at 24.2 inches wide, 22 inches deep and 59.5 inches tall, the Centurion is nice and tall yet slim enough to fit just about anywhere. In terms of security, the Centurion has a lot of impressive features: an advanced electronic lock and military locking bars plus an internal “Z” bar to keep your guns safe out of the hands of anyone that would want to steal them. Electronic tamper-proof lock. Electronic “smart” locks are far more difficult to break into compared to old fashioned safe locks. Easy access door. This safe’s strong yet flexible hinges offer 180 degrees of freedom. Military locking bars. Liberty decided to implement this feature after discovering that it made their safes 6 times stronger against prying attacks. 14 gauge steel body. This safe’s 2 piece heavy duty body offers fewer weak points compared to 3 piece safes. Internal Z bar. The Z bar provides yet another defense against attempts to pry open the door. Lifetime warranty. Like all Liberty safes, this one comes with a limited lifetime warranty. USA product. Liberty safes are manufactured and assembled in the United States. Unlike Liberty’s high end safes that offer more fire resistance, this entry level model only provides 30 minutes of protection against 1200 degree heat. 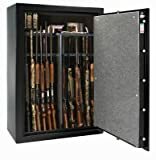 This 24 gun safe from Liberty is an entry level safe that’s big enough to accommodate a large gun collection yet still compact enough (59.5″ x 28.25″ x 22″) to fit in any house. One of the best things about the 24 gun version of the Centurion is that it’s much less expensive than other safes this size. Even though it’s cheap, you still get lots of high end features: thick 14 gauge steel walls, a tamper resistant electronic lock, and an internal anti-prying “Z” bar are just a few of the highlights. High tech lock. 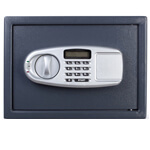 The electronic “smart” lock on this safe is preprogrammed with innovative failsafes that prevent unauthorized entry. 180 degree door. Some safes have stiff doors that are hard to use, but this one comes with an 180 degree hinge that opens and closes smoothly. 6 times stronger against prying attacks. Liberty safes incorporate military style locking bar technology to defend against the most common cracking attacks. Extra strong walls. Most safes only have 12 gauge steel walls, but with the Centurion you get 14 gauge steel. Z bar defense mechanism. The Z bar provides another layer of defense against thieves and safe crackers. Lifetime warranty. With all Liberty safes, you get a lifetime warranty that never expires. Built in the USA. If you want quality products and excellent customer service, you won’t go wrong if you buy American. 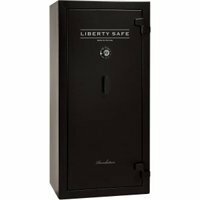 This basic safe has many impressive security features, but it’s not as strong against fire as Liberty’s other higher end products. This 48 gun “Fat Boy” safe from Liberty offers far more internal space and fire protection compared to the company’s entry level safes. Also, the Fat Boy features more security features, too. 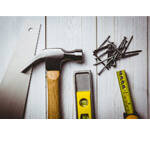 It’s got 12 thick steel bolts to keep the door in place, triple hardened steel plates to protect against drilling attacks, plus a highly advanced cam-drive bolt locking mechanism with a slip clutch handle. Certified burglar proof. Thanks to the extra level of security that this safe offers, it recently earned a UL Residential Security Container classification. Extra wide. Measuring in at 56.5″ H x 38″ W x 14.5″ D, the Fat Boy is much wider than other safes, yet not as deep. Extra protected against fire. Liberty’s entry level safes only resist 1200 degree fire for 30 minutes, but the Fat Boy lasts for an hour. Fully upholstered. All the surfaces inside the safe are covered in protective fabric. 12 door bolts. Most safes have around 8 door bolts, but this one has 12. Lifetime warranty. 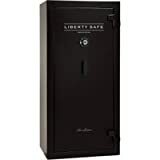 Liberty is so confident in their safes that they always offer a lifetime warranty. Manufactured in America. All of Liberty’s factories are located in the United States. This high end Liberty safe is significantly more expensive than its entry level models.